I had an arm injury back in 2008 in which my right arm was caught in wire racking twisting my wrist & forearm. At the time they only found that it was bruised but since then I have battled issues with it. In the summer of 2011 I finally had a doctor that took a chance & did an operation opening up a couple of sheaths & cleaning out inflammation & scar tissue with the extensor tendons, to have a great result. After having that done 3 years after the original injury I now have carpal tunnel in my left hand/wrist from compensating for the right. I am going to be having carpal tunnel surgery soon. I have read mixed reviews on having carpal tunnel surgery done & was wondering if you would be able to give me some insight? I also have a pinching feeling in my right arm which was injured between the forearm & elbow, which I had at the beginning of my injury but kind of subsided with increased pain in my wrist. Now that my wrist has been taken care of & have been lifting up to 70 lbs again. I recently took an injection in the area hoping it may have been just a nerve issue but that is not helping, would you possibly have any suggestions what I may need to have looked at? At one time in 2009 I had physical therapy on that arm & one of the therapist told me my muscles felt like a washboard when he was doing a deep tissue massage, would that give any indications? have a Tendonitis dynamic in place, which means that you have a Pain Causing Dynamic in place. I have some questions before I'll comment. 1. Describe the injury. What exactly happened? 2. How 'bad' was the original injury? What were the results the same day, the next day, a week later, etc. 3. Why exactly did the surgeon 'take a chance' with surgery on the right side? What was the situation that had him do that? 4. Why exactly do the think that Carpal Tunnel surgery is now a good idea for the left side? 7. History of other injury? 8. Describe your Carpal Tunnel Symptoms on the left side. 9. Describe your current symptoms on the right side in greater detail. The tight muscles as described by the PT is good information. Was that the right side, the left side, or both sides? 10. You called it extensor tenosynovitis. Why? I'm 42 yr female, with health issues.I’m 5',over weight.I lift from a few ounces-75lbs& a lot of repetitive gripping.I was on top of a 12'ladder & it was pushed out from under me.Bins divided by hanging wire racks & depending on how full the bin is depends on the give of the racks.As the ladder went a couple of fingers on my right hand were stuck in the wires,my arm twisted,slid under it,which was less than 2"in hgt,pulled as I went down.Instant swelling in arm,blood pooled under the skin on inside of arm from elbow to wrist,side to side.X-ray showed blood &the bone couldn't be seen clearly but dr said it wasn't broke.Swollen for over a month,large lumps from where the blood had trouble working back into the tissues.Continuously told bruised,no drs went much past the wrist in x-rays.A year later had it looked at again.Had therapy July'09-Dec'09 w/no improvements.MRI showed inflammation around the tendons in the wrist but nothing else.Arthroscopic surgery Nov'09,removed inflammation,scar tissue & when told dr it wasn't right after the surgery,was told nothing else could be done,also told by the therapist that the pain was from wearing a brace for so long.After that couldn't put any weight at all on my wrist/hand,couldn't hold a pen,lift any kind of weight.Still today if I try to stir anything thick my arm hurts & feels like it's in a spasm/swells,get the same feeling if I have to have a blood draw or IV in that arm.Had 3 drs treat it as tendonitis, gave me injections in my wrist joints,just for my hand to swell so bad it turned black.My current dr looked everywhere he could for answers.Showed me one spot in my arm had appeared to have been broken & MRI showed extensor tenosynvitis in my right wrist.He didn't think surgery would help any,but I could barely move my hand up or down,wrist was so swollen/painful,he agreed to go in to look.In June'11 had surgery,removed a lot of inflammation,scar tissue,opened up sheaths to 2/4,did not find where the inflammation was coming from.I've had tendonitis in the right wrist for years from falls.The difference is amazing.I can use a can opener, hold an ink pen.When going through this though my pain began just below my elbow, ran down into my hand but the pain in my wrist/hand overrode it.Now lifting 70 lbs again that pain is back.It is a very sharp pinching,like I'm trying to twist something that is not suppose to move.When seeing the therapist for right wrist/arm an assist. noticed how the muscle just below my elbow was like a washboard when did a massage. It is this same area that I have the pinching.Carpal tunnel in my left,an EMG showed mild carpal tunnel but physical symptoms are worse.Swelling in my hand during the night,cannot move my fingers or wrist.A lot of tingling/numbness,I drop a lot of because I cannot feel it is in my hand.3 drs told me carpal tunnel including my dr & recommend surgery.My dr believes not only because of the symptoms but also because of compensating 3 yrs for other wrist. I will try my best to answer your questions. I am a 42 year old female. I'm 5' tall & currently very over weight, I also have health issues as high blood pressure, low blood sugar, asthma, depression & a lot of allergies. My accident happened back in 2008 in which I work in a packing/distribution warehouse taking care of the inventory, doing daily counts of thousands of items varying in weight from a few ounces to 75lbs. I happened to be on top of a 12' moving ladder leaned inside a bin & the ladder was pushed out from under me. The bins are seperated by a hanging wire rack, depending on how full the bin is depends on if the rack has any give or not & this one did not. As the ladder went out from under me a couple of fingers on my right hand got caught in that racking, my arm slid underneath it, which had less than 2" in space between the hanging rack & the fixed rack. As my arm slid in that spacing my wrist twisted & my arm was wedged along with I slipped down a couple of steps so it was also pulled. The area where my arm was wedged was just over high way up my forearm. Once I was able to get my arm out it instantly started swelling & blood was instantly pooling under my skin on the inside of my arm. When it was x-rayed, there was so much blood under the skin that the bone was hard to see but the doctor said it wasn't broken. I endured swelling & bruising for well over a month. I was constantly told it was just bruised. 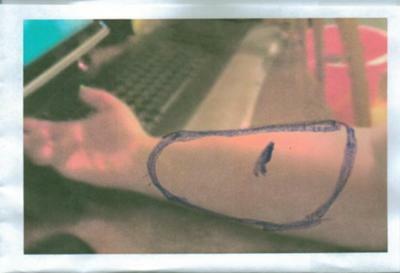 The blood had trouble working back into the tissues so I had large lumps on the inside of my arm for several months. No one would look at it after that, but finely a year later I had so much pain in my arm & wrist, it was looked at again. When x-rays were taken they didn't go much past my wrist, insisting that the issue was in the wrist. I had physical therapy from July '09 to Dec '09 w/no improvements. At one time I had a different therapist than normal & he had made the comment of how the muscle in my forearm just below my elbow was like a washboard & I was able to feel that too. 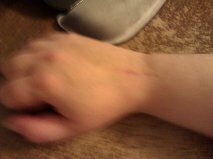 In Nov. '09 a MRI was done of the wrist & showed inflammation around the tendons but did not explain the pain I was in. I had arthoscopic surgery in Nov. '09 in which the doctor at that time cleaned out inflammation & scar tissue. After that surgery I was unable to put absolutely any weight on my hand or wrist without being in extreme pain. When I mentioned it to the doctor that did the surgery he told me there was nothing else he could do & released me at that time. My therapist at the time told me he believed the pain I was going through was because I had been in a brace for so long, but even after not wearing the brace there were no improvements. After that I continually tried to find a specialist that would look at it. I kept getting injections in the wrist joints, just to have my hand swell so bad it would turn black. I finally found my current specialist. He had told me it appeared that my arm had been broken at some time. He also told me no more injections because my wrist was changing color. Up to that time I was continuously diagnosed with just tendonitis. I've had tendonitis for years from falls earlier & never had issues or pain like that. My current doctor did every test he could to find an answer. The last MRI showed inflammation around the tendons & it was at that time I was told I had extensor tenosynvitis. He at first didn't want to do surgery because he wasn't sure it would help me any but the pain & swelling just continued to get worse to were I couldn't bend my wrist so at that time he said he would be willing to go in & look. When he went in he cleaned out inflammation again & scar tissue but he also opened up the sheaths to compartment 2 & 4. He could not find what was causing the inflammation though. During recovery he had me out of a sling that night & out of surgical bandages within 3 days after the surgery so I could start moving it, I believe that helped out a lot in my recovery. It has taken a while but it is so much better. Prior to the surgery I couldn't hold an ink pen to write or use a can opener without extreme amount of pain & now I can do it easily. I still have trouble with the forearm if I try to stir something with some thickness to it, I've found swells from my elbow down to my hand & feels like it may be in a spasm, I also have the same trouble if I have a blood draw or IV in that area, this is the area that was like a washboard. Now that I am back up to lifting the heavy weights I've started having issues with the forearm again & I get a very sharp pinching like I am trying to make something move that is not suppose to, it is also very tender for me to try & massage that area. My left hand/wrist now has carpal tunnel. I've had an EMG that showed mild carpal tunnel but the physical symptoms are much worse. I've had 3 doctors tell me it is carpal tunnel & that surgery is recommended. My symptoms are extreme tingling, numbness, swelling & I cannot hold certain things because I cannot feel them in my hand so I continuously drop things & do not realize it. My current specialist recommends the carpal tunnel surgery because of the extent of the symptoms & because my left hand has had to compensate for the right for 3 years in repetative lifting & gripping, he feels it has been through too much & now I have the possibility that the right has permenant damage & won't be able to do some things. I am ready to have the carpal tunnel surgery done because of the amount of pain I have & my doctor has already given me the confidence with the help on the right wrist. I know my doctor would not do this surgery if he didn't think it would help any. Wow. That's quite the scenario. 1. Were you totally fine before the fall? 2. Was your wrist/forearm compressed in the fall? 3. Please describe the specific movements/actions of the injury. I can't quite picture what exactly happened: your fingers got caught, and then how exactly did you fall, what exactly happened with the wrist/arm? Did the wrist twist? Did the elbow twist? Was something crushed/compressed? Etc. Would there be a way I could send you a couple of pictures of the accident area? I don't know if that would help you kind of get a picture or not. I really wished I had pictures of my arm at that time but never had that thought until 3 years later, it really would've helped in many areas, I think. The ladder was a 12' high, moveable rolling ladder, like a large set of stairs in which when you step on the bottom stair it locks it down into place so it doesn't move on you. The one I happened to be on was brand new & was able to be moved very quickly with just a little push. The ladder was moved @ 2' from the spot it was originally locked in, the person that pushed it was in a hurry & didn't look to see if anyone happened to be on it. Since it moved very quickly & I was 12' up, my instant instinct was to grab something to hold on. I was able to firmly grab the horizontal racking on the bottom of the bin with my left hand without my hand or arm twisting but I'm not exactly sure how my right hand ended up in the position it did. 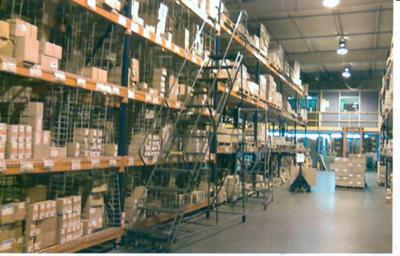 If I remember correctly my arm ended up, inside up, bent at the wrist, as if I was holding something out in my hand, my pinky finger & my long finger were stuck in the vertical wire racks as if I had been gripping it, but wasn't, & the wrist twisted side to side. My forearm was between the steel frame of the racks & the vertical wire racking that had no give. My arm thickness is probably about 3"-4" & that was squeezed into the just less than 2" space between the frame & racking. I had never thought if my arm had twisted at the elbow until recently but I do believe it did because my legs gave out from under me & that's when I fell down about 2-3 steps before stopping, I was more less hanging by my right arm when everything stopped because when I went down the steps I was able to use my left hand to grab on to the ladder railing. 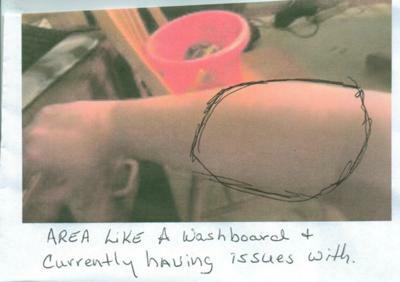 Once the ladder stopped & I climbed back up those steps to pull my arm out & when I was able to pull my arm out, there was a large indentation from the wire racking on the inside of my arm where the blood instantly started pooling & swelling at, but the skin was not broken. I ended up with pooled blood from just below my elbow to my wrist & clear from side to side on the inside of my arm that lasted a couple of months & did not take long for that bruise to turn black in color. I wasn't able to understand how the doctor made the call that it wasn't broke because I myself was not able to see the bone from the blood. I'll email you. Email me back and attach pictures. If you can take one with your body/arm in the general idea/position of how the arm got stuck that'd be useful. Your bone didn't have to break to have that response. That's definitely a crushing injury. Probably some crushing with some deep frictional tearing. As far as previous injuries, I had injured my right wrist about 20 years prior in a fall that came close to breaking it but hadn't. I had tendonitis from that injury but had only bothered me occasionally in the colder weather & I was able to use a splint occasionally, an anti-inflammatory & ice & in a couple of days would be better for months at at time. I have endured pain ever since except for a few months after my last surgery when I wasn't lifting a lot of weight at a time, but now that I'm lifting more weights repeatedly the forearm just below my elbow has began having issues again. My right wrist has done very well without the heavy lifting but with the lifting & on days that I tend to do more I will have pain shoot down into my wrist/hand into my long finger. I was wondering if you had gotten a chance to look over the photos I had sent on 3-3-12 & if you had any more questions from them? Thanks for the reminder. I lose things/people from time to time. You got some compression injury when your arm got stuck. 1. Deep bruising of the fleshy tissue, and of the connective tissue wrapping the bone. This not only hurts long term, but can constantly send a signal that brings on inflammation and swelling. 2. Due to the compressive nature of the fall along with physics, there was torsion-induced rip and tear of the deep tissue. Mean, connective tissue attaching flesh to bone had to rip and tear to some degree. This would account for the constant pain and swelling. 3. Then you had surgery, which effectively cut and sliced connective tissue layers, which have to knit back together with scar tissue, tightening up as it goes. So regardless of 2 or 3, your tissue is A. stuck, and tightening and B. constantly sending an 'I'M INJURED!' signal to the brain, which responds accordingly. You're experiencing Carpal Tunnel Symptoms (make sure to read that page). The question is, is all the numbness and tingling and such coming from the ONE SPOT ON THE WRIST where the surgery would cut into? Or is it also coming from tightness further up the arm, and/or at the shoulder and neck? Is some/all of it coming from the relationship between Carpal Tunnel and Vitamin B6 Deficiency? Hopefully Carpal Tunnel surgery will fix the left side....but what if it doesn't? Then you have the downsides of surgery too. Indulge me if you've already answered this, but...have you ice dipped both hands/forearms up over the elbow, as described on the How To Reduce Inflammation page? It's my opinion that you'll want to try some things, some effective things, before going under the knife again. As far as the left hand the numbness & tingling was coming from the wrist just below my now incision & radiated up through mostly my long finger & pointer finger, eventually spreading to all of them. I had my surgery done back on March 9th & when my specialist made the incision he made the comment of my hand being so tight. The finals days before my surgery my hand swelled so bad I couldn't bend my fingers or bend my hand down. Since my surgery my hand is still pretty tender but I haven't had the numbness & tingling & although I'm still not to lift I'm not dropping the little things that I couldn't feel before because I can feel them now. I can also tell a big difference as far as swelling in my hand, there is not near as much as there was. I keep icing it down especially in the evenings after a long day of work. I haven't "iced dipped", I actually hadn't heard of that until I found your site, but what I have done is I have a couple of ice packs that are as hard & cold as ice & instead of placing something in between them & my skin at first I will use the first ten minutes or so putting it directly on the spot, wrapping all the way around my wrist & hand, for a few seconds then taking it off & putting it back on repeatedly, then once the pack starts to thaw a little I will leave it on longer. Also when I put the packs on I wrap the whole wrist not just the area with the pain. I hadn't tried with my arm because when I asked the previous doctors about my forearm causing the issue with the wrist they told me they didn't think anything was wrong with the forearm, it was all in the wrist. When I started seeing my current doctor my big issue was with my wrist because after the first surgery I couldn't lift, use a pen to write or put any weight at all on it & with not being able to lift therefore the pain in the forearm subsided some. Now that I was back to lifting more than 5 lbs. the pain has resurfaced, unfortunately. My current specialist has told me I will most likely not be able to lift over 20 lbs again especially repetitively & I've had both my work's doctor & my doctor tell me I will not be able to continue with the job I do now. What bothers me probably more is the fact I have trouble using a screw driver or mixing a thick batter because it tightens & swells, at least now it doesn't swell as long as it use to. To be able to grip & have to use some muscle behind it leaves me in pain. Could I ask in your opinion, you had said in #1 about having pain long term do you think this is something I will have to work around the rest of my life or would there be a possibility something may get better over time? Would you be able to give me some suggestions to ask my specialist, possibly a direction to look? 1. That's an ok icing alternative. Personally, I would Ice Dip. 2. I highly suggest that you get my Reversing Wrist Tendonitis ebook. It's going to be up to you to rehab your arm. You need to learn how to soften and open up damaged and constrictive tissue. It's going to take something, and some time, but I believe you can make your arm happy again, even with the damage from surgery. Let me answer your last question a little more. 1. Did the original injury cause nerve damage? 2. Did the original injury break bone? 3. Did the original injury rip/tear any tendon or connective tissue structure? 4. Did the surgery do any of the above? If the answer to some or all is 'No', you're going to have to do some specific self care. If the answer is 'Yes', you're still going to have to do some specific self care. Will this just heal on it's own over time? Some, yes, but doubtful it'll be as much as you want. Can you make it heal better/faster? Absolutely? How much better/faster? I don't know. That depends on you, and it depends on your body, and what exactly is going on in there. Do your surgeons have anything else for you? It doesn't sound like it. Does western medicine have a miracle cure for you? No. Is there a miracle cure? Not that I know of. But there is working with the basics of how the body works to help rehab the structure(s). On June 1st I underwent yet another surgery on my right arm, this time instead of the wrist, on the elbow & forearm. My doctor cleaned out my elbow & when he went in to open up the compartment around the nerve he found the nerve twisted, pinched & discolored. I haven't gotten to see him since the surgery, I will see him again on the 21st of June, but when he told me this after the surgery he was pretty confident about a full recovery. He told me that he did not see any indications of a crush injury, I'm still curious how the nerve had gotten into that condition. Huh. That's interesting. I'd sure like to see a picture of that, had the surgeon taken one. I can imagine that happening if the connective tissue/muscle was deeply wrenched by the shear of the original fall injury. Ideally it is now NOT twisted, impinged, discolored. My doctor didn't mention if had taken a picture, but if he had I would like to see it myself too. I see a therapist on Monday, June 11th for my stitches & bandages & then I won't see the doctor again until June 21st. With it only being 8 days since the surgery my forearm & especially my elbow is very tender buy my doctor believes that it will make full recovery & will be good to go. Hey, Josh. Thanks for the response. The name for the purchase would be under Mark, but my e-mail is under Cole. I still haven't received it. I got the SamCart App e-mail right after purchase showing the info above, but that's it. Joshua - I just sent you your program via email. Please confirm here or there that you received it (or both, just to make sure).